Phil Mickelson was kind enough to tee it up for an education talk with me. Note: Phil is a professional golfer and science education fan, who is championing the ExxonMobil Teachers Academy that he and his wife, Amy began more than 6 years ago. The Mickelsons are a class act, with a passion for helping science and math teachers bring experiential lessons and techniques back to their classes, schools, and district. Ken Royal: Phil, I’ve followed the Teachers Academy for quite awhile—you’ve been doing it over six years now, right? Phil Mickelson: Yeah. This is our seventh year. We’ve had over 3,000 teachers go through the program and we feel it’s had a direct impact on over 45,000 students but, Ken, one of the biggest things about the Academy I think is that there’s no financial burden or no strain on a district. It’s all expenses paid, air travel, hotel, food for them arranged by ExxonMobil and the Academy. Ken Royal: That’s great. So, how does a teacher get to be a part of the Academy, Phil? Phil Mickelson: The easiest way to be part of the academy, or one of the best ways is to go to sendmyteacher.com to apply. Last year, we had 1,500 of teachers apply for the Liberty Science Center Academy. 200 teachers made there. So, we’re not able to accommodate everybody or accommodate all the demand, but we’re able to get a substantial number. Other academies were held in Houston and Orleans this year, too—each with 200 teachers attending. Ken Royal: Looks like you’re going to need more academies? Phil Mickelson: Well, we’re doing the best we can. The biggest thing is that these teachers can take the experience, go back to their school, or district with new teaching techniques, and help other teachers with their teaching skills. Ken Royal: Phil, did this—for you and Amy—have anything to do with your background in education—as well as the learning you wanted for your own kids? Phil Mickelson: I think that it did. When Amy and I were growing up, the importance of education was instilled in us. We knew we were going to go to college. It wasn’t a question of whether to go to college or not. We looked at education as building the foundation like building a skyscraper—it’s a foundation for life. And the bigger and more solid your foundation is, in this case your education, the higher you can build your skyscraper. So, that was deep-rooted in us at a young age. Our country has fallen off recently, especially in the areas of math and science education. There’s a real need for us to maintain our status as a leader. We need to turn this trend around. Ken Royal: Phil, I’m old enough to remember shoebox science and how much fun that was and how it engaged kids. They all want to be a part of science at that point. I think what you’re doing here is pretty much a similar thing. You’re giving teachers a chance to do some fun things, but also some very experiential things. Do I have that right? Phil Mickelson: That’s exactly it. What we’re doing here is sharing inquiry-based teaching skills with educators, so teacher can go back to children to get them actively involved in learning. Teaching is not just from a textbook. We’re asking questions, having them explore and form hypotheses, develop experiments, and see what actually occurs, what actually works, or what doesn’t. And furthermore, discover why it did work and why it didn’t work. The Academy’s inquiry-based learning is sharing these necessary skills with teachers, specifically in the third through fifth grade levels, where they may have to teach a number of subjects. Many of them don’t have accreditation in science, so they don’t feel as comfortable teaching it. Ken Royal: So, you’re actually doing a professional development to get teachers who like science initially, but maybe don’t know how to do those experiential inquiry- based learning projects. Phil Mickelson: That’s exactly what we’re doing. Ken Royal: Can I ask you just one more thing? The academies are in partnership with ExxonMobil? Ken Royal: Can you talk a little bit about what they’re doing to make that happen for districts and schools? Phil Mickelson: Well, ExxonMobil has a huge foundation that gives back to communities all across the country, as well as the world. They have a huge educational motivation. They hire over 14,000 scientists or engineers—so they see the need for great science and math students. They have a direct tie. So, with our partnership with them, we are able to help with a long-term learning solution. Ken Royal: What you’re doing as far as having kids question and experience and write about sorts of things, and having teachers take all that in is great stuff. Phil Mickelson: Ken, we live in an increasingly technology-driven society and the basic understanding of math and science has to be much higher than in years past. I’d like to use this as an example: A mechanic 20 years ago was able to change the oil, fix transmissions, new clutch, those type of things, but today, the cars are so technologically savvy and innovative and computer- driven—a mechanic has to have solid computer knowledge to be able to work on your car. 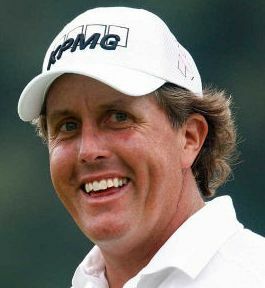 Phil Mickelson: The other thing, too, is we want to make science and math cool for girls. ExxonMobil is involved. They’re using Sally Ride Science for that. Ken Royal: Yes, I know the Sally Ride program for STEM and involving girls well. Fantastic Phil. Thanks for the interview. and how about it, you didn’t need Bones reading greens with this. Phil Mickelson: No, not for this. Thanks Ken, I appreciate your time. Ken Royal: Thank you for doing this, Phil. Phil Mickelson: You got it.